From left: ABA Chairman-Elect Ken Burgess, Laurie Stewart, ABA Vice Chairman Jeff Szyperski, Luanne Cundiff, ABA Chairman Dorothy Savarese, ICBA President and CEO Cam Fine, President Trump, ABA President and CEO Rob Nichols, Leslie Andersen, ICBA Vice Chairman Tim Zimmerman, ICBA Chairman Rebeca Romero Rainey and ICBA Chairman-Elect Scott Heitkamp. 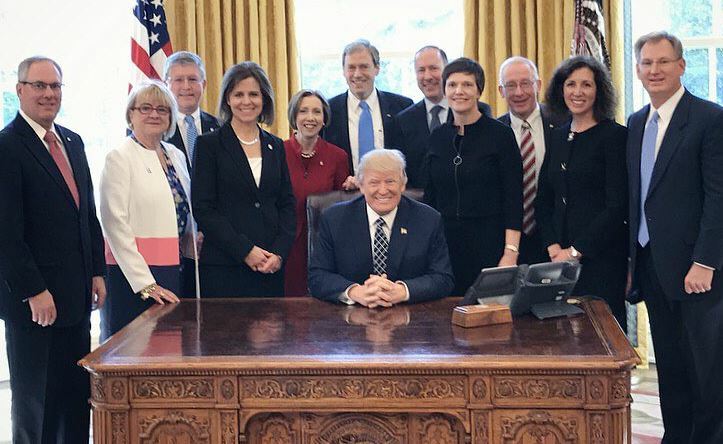 Six of the American Bankers Association’s community bank leaders met with President Trump at the White House this morning for a “listening session” on the challenges that community banks face today and how the regulatory environment can be reformed to promote job creation and economic growth. Bankers raised topics like tailored regulation, accountability for the Consumer Financial Protection Bureau, regulation of small business and mortgage loans and the need to align regulatory capital requirements with risk. Representing ABA members were ABA Chairman Dorothy Savarese, chairman, president and CEO of Cape Cod Five Cents Savings Bank, Orleans, Mass. ; Chairman-Elect Ken Burgess, chairman of FirstCapital Bank of Texas, Midland, Texas; Vice Chairman Jeff Szyperski, chairman, president and CEO of Chesapeake Bank, Kilmarnock, Va.; Leslie Andersen, president and CEO of Bank of Bennington, Bennington, Neb. ; Luanne Cundiff, president and CEO of First State Bank, St. Charles, Mo. ; and Laurie Stewart, president and CEO of Sound Community Bank, Seattle. Also participating were ABA President and CEO Rob Nichols; Independent Community Bankers of America Chairman Rebeca Romero Rainey, chairman and CEO of Centinel Bank, Taos, N.M.; ICBA Chairman-Elect Scott Heitkamp, president and CEO of ValueBank Texas, Corpus Christi, Texas; ICBA Vice Chairman Tim Zimmerman, president and CEO of Standard Bank, Monroeville, Pa.; and ICBA President and CEO Cam Fine. Treasury Secretary Steven Mnuchin and National Economic Council Director Gary Cohn also joined the listening session. “We look forward to continuing to work with President Trump, the White House team, the Treasury Department and members of Congress on both sides of the aisle to bring pro-consumer reform to our nation’s financial system,” Nichols added. Nichols discussed the meeting afterward in a live interview on “Bloomberg Markets.” The bankers and Trump discussed ways to “make it easier and more efficient for community banks all over the United States to serve their customers, clients and communities,” he said. Also on the table were “artificial asset thresholds” that inhibit community bank growth. 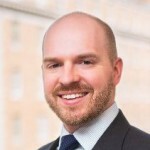 Nichols also told Bloomberg correspondent Kevin Cirilli that the group had discussed the wave of forthcoming appointments to financial regulatory agencies. While no names were raised, “this president definitely understands the need to have people with real-world, common-sense experience at these regulatory entities,” Nichols said. Laurie Stewart — a former chairman of ABA’s Government Relations Council — appeared on CNBC’s “Closing Bell” program to discuss the meeting. “The president was listening about the layering on of regulations and the things that are impeding us from lending,” she said, highlighting the Qualified Mortgage rule and Home Mortgage Disclosure Act expansion as examples.